And Looking Ahead to Spring . . . The Scholastic Spring 2010 catalog has gone out, and I know many librarians, booksellers, and reviewers will be requesting review copies or ordering actual ones soon; may I suggest you keep an eye out for these novels? Eighth Grade Superzero by Olugbemisola Rhuday-Perkovich. This book, a debut novel, came to me via query letter, and I will admit that the first thing that made it stand out to me was Olugbemisola’s (a.k.a. Gbemi’s) wonderful name. But I requested the first five chapters, then the whole manuscript, based on the characters, because they were so terrific and true and not like anything else I had ever seen in a novel: Reggie McKnight, the son of two Jamaican immigrants, struggling to figure out God and girls and his place in the middle-school ecosystem; his best friend Ruthie Robertson, a loudmouth activist with a terrific heart; his other best friend Joe C., an aspiring DJ and the artist on the “Night Man” comic that Reggie writes; Reggie's sister Monica, struggling with her own image issues; his “Little Buddy” Charlie, whose "Dora the Explorer" sneakers inadvertently inspire a revolution; George, a homeless man Reggie meets in a shelter, who inspires him as well. . . . In case you can’t tell, I feel like every character in this book is a personal acquaintance living just a few miles away from me in Brooklyn, and I adore them all (with a special affection for Joe C. and his woolly eyebrows; I think I occasionally drew hearts next to his name in the manuscript). It’s a great New York City book, with cameo appearances from the Atlantic Center and Fort Greene Park and Forbidden Planet. It’s also a great God book, one that shows how religious faith and questions can drive both activism and our everyday lives. And it just has more reality per square page than many books—about middle school, and race, and changing the world. Out in January. 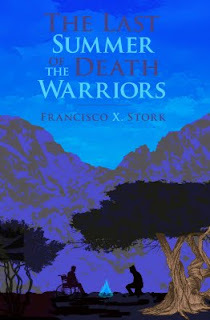 The Last Summer of the Death Warriors by Francisco X. Stork. This next book by the author of Marcelo in the Real World is very different from it in content (though not in quality): A young Latino man out to avenge his sister’s death meets a loudmouthed White guy dying of brain cancer, and the summer that follows—and a girl they both fall for—change them each irrevocably. The premise may sound schmaltzy, but there is not an ounce of sentimentality in this book; it may make you cry, but it earns the tears. (And damned if it won’t make you laugh, ache, and sigh as well.) This manuscript hit my desk in January, and it was so strong from the very beginning that I moved the pub date up a whole year; it's written in third person -- rare for a YA novel these days -- and Francisco handles it just as fluently as he did the first-person narration in Marcelo. With another gorgeous cover* by artist Dan McCarthy. Out in March. These books both sound wonderful! Can't wait to read them! Well! I will definitely be watching for both of those. I "know" Gbemi cyberly, and loved Marcelo in the Real World, so both of those go on my list. 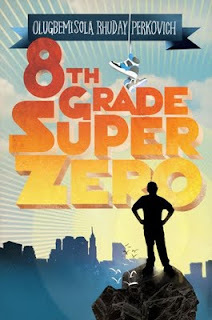 I just love the title, 8th Grade Super Zero--very clever! I got to read an ARC of Gbemi's book. It's completely amazing. I didn't want it to end! I love both covers... just as I loved the cover of Marcelo in the Real World. The colors of the jpeg might look strange if it's CMYK, not RGB... that sometimes happens to me when I upload images. Thanks for the sneak peek!